I'm looking for a turn structure diagram for Magic the Gathering to use for teaching new players. 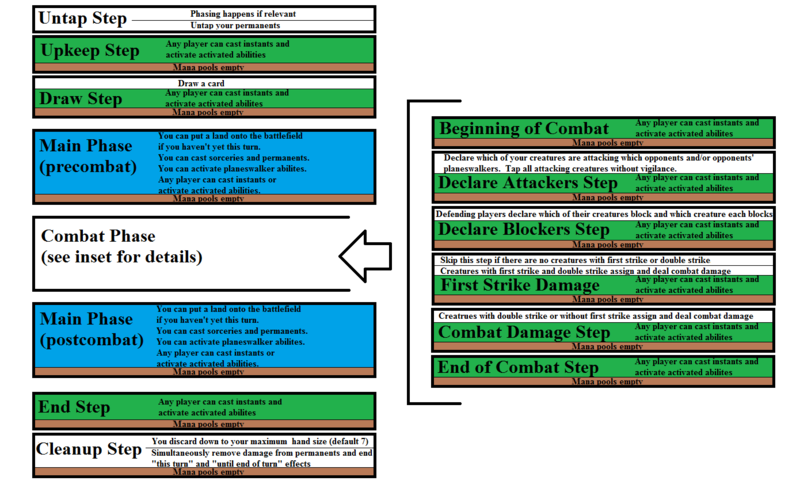 There is a lot of information to keep track of in the turn: there is everything from the fact that the Upkeep Step comes before the Draw Step to when you can play abilities between the game actions of the Combat Phase. For new players in particular, a graphical representation is particularly useful since I want them to gain an intuitive grasp of how the turn progresses as well as be able to reference particular details that become relevant. I have seen charts that list the steps and phases in order but I need something more than that for teaching and reference. 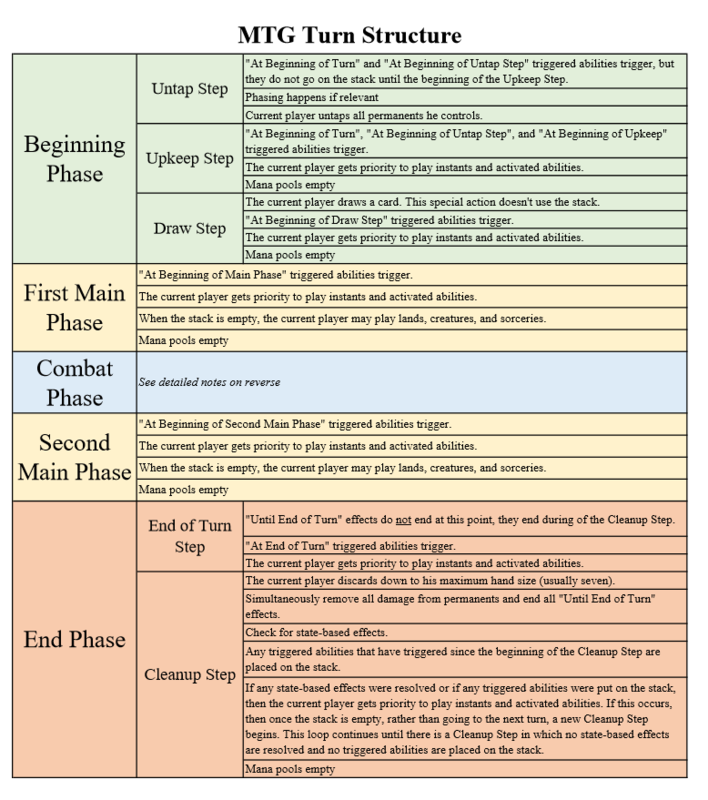 Where can I find a chart that includes the order of steps/phases, when you can use various types of cards and abilities, and what game actions happen when? [[Clean Up Step] Until end of turn things end, active player discards down to 7 cards, state based effects are resolved. If anything has triggered: Priority and repeat this step. Disclaimer: this chart is based on the old rules, and so the particulars are very incorrect. But If someone is interested in enumerating the issues, I will update the chart. Consider editing my answer with a list of errata at the bottom. I found this chart that has a lot of detail - I copy-pasted it into excel and tweaked the formatting a bit because I wanted to print it. I also added the mana pool emptying to it, based on @Zaga's. But, as pointed out in the comments, the rules here are out of date. Not the answer you're looking for? Browse other questions tagged magic-the-gathering teaching or ask your own question. What can be played during an opponents turn? Can Yahenni become indestructible after taking lethal damage, and does it die then? 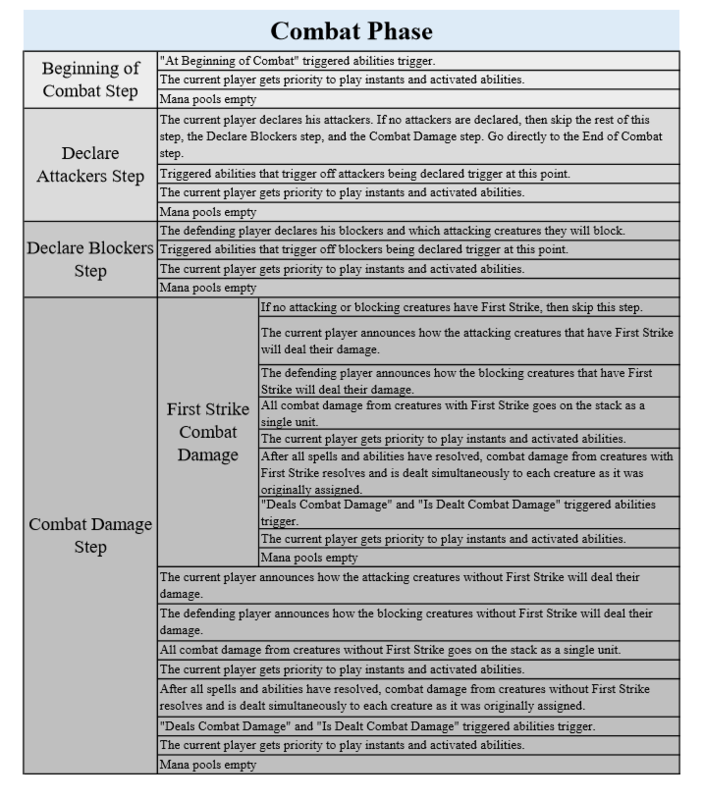 Does the effect of an instant supersede first strike damage from a creature? When exactly does an attacking creature become tapped? Does a tapped or removed attacking creature still deal its damage? When can I cast spells? What order do triggered abilities happen in if multiple things trigger at the same time? How can I teach other people game rules? Voracious Wurm and Wall of Reverence: which trigger happens first? When can lands be tapped?